Nkibelo* is a salesperson at a big company. Lately, he hasn’t been feeling too well. He’s been working extra hard to make his targets, and then one day while he was visiting a client, he fainted. They took him to hospital, and he was diagnosed with extremely low blood pressure. The doctor booked him off work for a week to recover, but on day three, Nkibelo’s boss called him to tell him he’s fired. They said they simply couldn’t afford to have someone with health problems working for them. Now Nkibelo is sitting without a job, and he has medical bills to pay! AZIKHIPHI! That’s not on! What his employer is doing is not right! Scorpion Legal Protection advises. Section 22 of the Basic Conditions of Employment Act (BCEA) gives minimum rules and guidelines employers must follow in terms of managing their employees’ leave. A sick leave cycle is 36 months (3 years) long and starts in the month the employee starts working for the company. A sick leave cycle recurs, which means that a new cycle starts at the end of each 36-month cycle. An employee’s sick leave is equal to the number of days the employee would work in six weeks. So, for an employee who works from Monday to Friday, it is 30 days. A new employee only gets 1 day’s sick leave for every 26 days worked (about 1 day’s sick leave per month) during the first 6 months of employment. 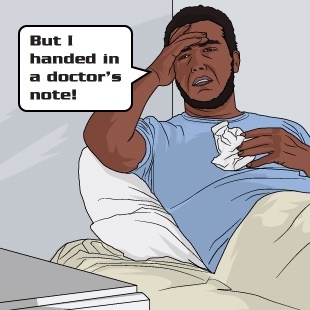 While the employee is off sick, the employer must still pay the employee his/her full salary/wage that they would have earned while they were off sick. In addition to this, the employer cannot just phone an employee to fire him – that is against the law. There are clearly defined processes and procedures that must be followed when it comes to dismissals. Dismissal without a proper hearing is never fair. Nkibelo can go to the CCMA to lodge a case of unfair dismissal 30 days from date of dismissal. If they find his dismissal to be unfair, he will be able to get reinstated or re-employed, or get compensation money from his employer.